I’ve heard it said that we all carry more knowledge than was contained in the Library of Alexandria in our pockets all the time—by way of the internet, of course. And there’s more information in any local library than even the most studious scholar would have been able to access a few centuries ago. I’m sure it’s true—but it doesn’t usually feel that way. 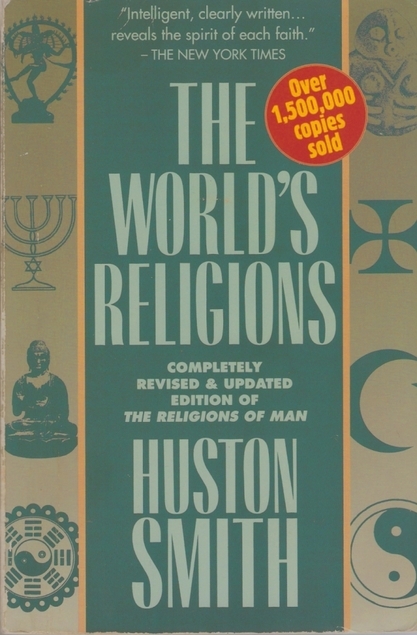 However—the other day I was poking rather idly through the library’s book sale table, and encountered The World’s Religions by Huston Smith. And now I rather feel as though I bought the collected wisdom of the world for a dollar on a random Tuesday. I’ve heard of The World’s Religions for years, actually read a chapter (the Christianity one) in a college class, but never got around to reading the full book. It’s excellent. With a chapter (some of them very long) on each of the major world religions, Smith puts together a compelling collection of the world’s wisdom traditions. He explains doctrine and major features of each religion, but I feel like he approached it from the angle of what each of these religions has to say about the big questions—how to live your life, what life’s purpose is, how to live in harmony with others. Basically, how all these different cultures have made sense of the world through their religious traditions. He starts with the Eastern religions: Hinduism, Buddhism, Confucianism and Taoism. Then he moves west to Islam, Judaism and Christianity, in that order. He winds up with a brief look at a few aboriginal spiritual traditions, especially in Australia. I found the chapter on Hinduism the most interesting, possibly because it was the one I knew least about. (By contrast, the Christianity chapter, while perfectly fine, was the least interesting to me personally.) It also was one that had a lot of emphasis on how this particular religious tradition makes sense of the world, and the paths it lays out for people to grow. For being, probably, the most “foreign” religion for my experience, I still found a lot that was relatable. That was actually one of the big take-aways of the book—that as different as all these religions look on the surface, there was a lot of overlap in concepts. It was also very interesting exploring the Eastern religions because there is one way they appeared to differ from the Western ones. In the West, you’re pretty much one religion. People aren’t Christian and Muslim. But the Eastern religions don’t seem to be that exclusive. As Smith put it, prior to the twentieth century, the Chinese were Confucian in their public lives, Taoist in their private lives, and Buddhist at their deaths. I am fascinated by that concept! At the end of the year, when I do my reading round-up, I usually have a category for “I can’t believe I didn’t read it until this year.” I think this one is a contender—and I’m really happy I finally read it! I read this book a long time ago – and saw the video about it, featuring the author, as well. He does a wonderful job of explaining the world’s religions in a relatable way. And he’s totally nonjudgmental. I enjoyed it and would highly recommend it. This is the book! I need to add this to my list because I’ve been looking for a source which contains explanations and elements of the different types of religion. It sounds like it explains all of the religions in depth as well as cultural elements. Interesting! It was also interesting to read your commentary and opinions about the book . I could learn a great deal from this book.